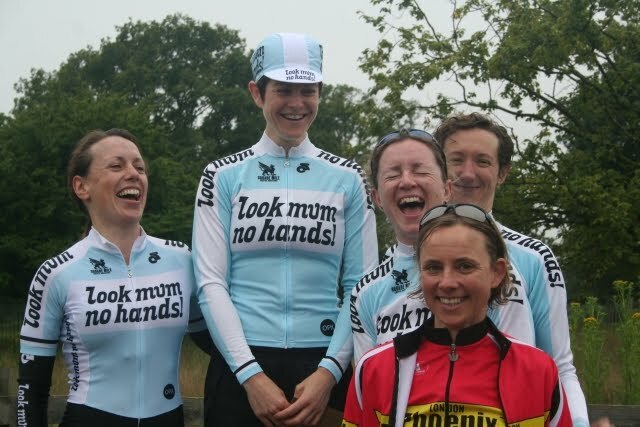 London Women's Cycle Racing: Round 7 results are up! The Richmond Park TT, organised and promoted by the London Dynamo club, was a resounding success for the LWCR with over two dozen riders taking part in the Lady Road division. Warm muggy weather and quiet breezy conditions made the early morning start for the ladies a bit more bearable (all the riders were off by 6:30am!) The popularity of the league and friendly nature of the event for novice riders meant the Road division well outnumbered the TT division, something that would never happen in a "typical" CTT event. Charlotte Easton of Look Mum No Hands! RT ran away with the win, followed by her teammate Helen McKay in second place. 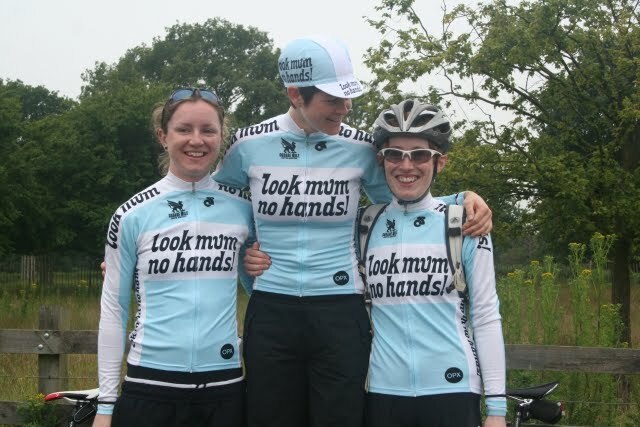 Third place -- something that can only happen in TTs -- was a tie between three riders, with Astrid Wingler of London Phoenix sharing the accolades with LMNH racers Lydia Boylan and Joanne McRae. Prizes for the top three finishers and the lanterne rouge (Antonia de Barton-Watson of London Dynamo) for this round were generously provided by AnaNichoola -- two pairs of her signature cycling gloves and two sets of arm-warmers. Special thanks to Rebecca Slack for her organisation and to John Mullineaux for taking great pics as always. Winner Charlotte Easton in the middle, with 2nd place Helen McKay on the left. In a three-way tie for third, Astrid Wingler (front), Lydia Boylan (middle) and Joanne McRae (back) squeeze together on the podium. Current league rankings show Charlotte Easton now in first place with a narrow two-point lead over teammate Lydia Boylan. Anna Grundy rounds out the top three. Look Mum No Hands! RT at the top of the league rankings with three rounds left to race. From left to right: Lydia (ranked 2nd), Charlie (ranked 1st) and Anna (ranked 3rd).